Disclosure: This post is sponsored by Swiss Farms. All opinions are my own. Way back almost 16 years ago today, my husband and I were cruising around Delaware County looking for open houses. We had our heart set on purchasing a home in the area but we were feeling defeated as house after house were either not what we had in mind or not in our budget. After an exhausting day of driving around, we came up 420 from Springfield into Folsom, I remember seeing a Swiss Farms. My eyes lit up as not only did it mean we did not have to get out of the car, but that we could grab some drinks and a snack as a pick-me-up before our next stop. After making our purchase, we drove out of the lot and saw an open house sign just across the street. This particular street had not been on our map of homes to visit, but we decided to check it out anyway. Little did we know that that fate would have it that the quick stop at Swiss Farms that day would lead us to a home that we would not only fall in love with – but would also bring new family, friends and neighbors into our life for the next 16 plus years! Here we are 16 years later and I couldn’t be happier or prouder to call Swiss Farms a trusty neighbor – and friend! The ability to drive through Swiss Farms for everything from milk to snacks, precooked meals, breakfast staples like bacon, eggs or butter – or a quick coffee-on-the-go has been a lifesaver more times than I can count! Call me spoiled, but from way back when my toddlers were too cranky to take shopping to the present 45 extra seconds that I currently have to spare before the kids need to be at a swim meet, I can always count on the quickness and convenience of Swiss Farms to grab what I need without the hassle of running through aisles or waiting in long lines to check out. 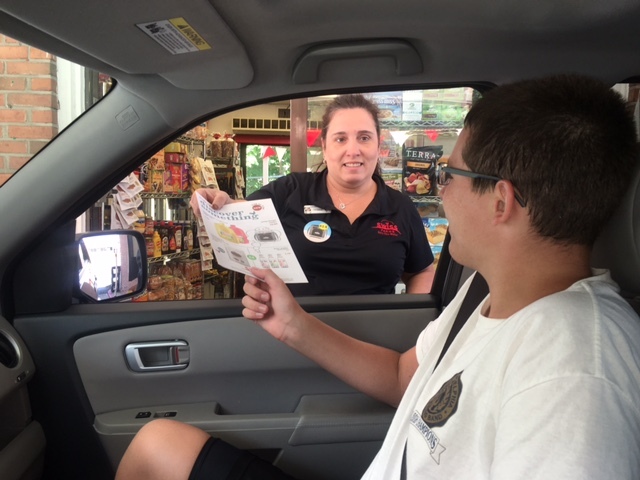 At Swiss Farms, you drive up to the window where you meet with a Swiss Farms team member, state your order, receive it, pay – and go! How awesome is that?! Oh – and my kids never – ever – complain about going through Swiss Farms! Kid approved – check! If you are a Mom like me, you know just how huge that is! Best of all, the drive thru offers bright signs clearly marked with photos and prices of popular items and specials. I also love that they offer plenty of healthy snack choices such as fruits and yogurts, pumpkin seeds, organic snacks and more! 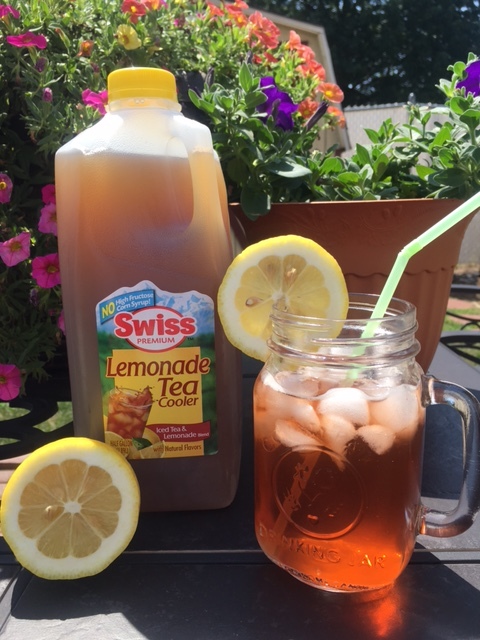 Of course, I will admit that the Lemonade Tea Cooler is and always has been my absolute favorite drink! Of course, I can never pass through a Swiss Farms without some of my favorite thirst quencher! Summer just wouldn’t be summer without my tea cooler! Extra pressed for time? That’s OK – Swiss Farms has that covered too! Groceries and prepared meals can be ordered in advance on the Swiss Farms website or via the Swiss Farms mobile app. The good-for-you options include healthier snacks, on-the-go breakfast items, ingredients to prepare lunch or dinner, and more. You order will be ready and waiting for you, making your stop even faster than ever! Gah – and I thought Swiss Farms couldn’t get any sweeter! I need an emoji for that! Anyway, now that you know all about my excitement for Swiss Farms, won’t you join me in celebrating National Drive-Thru Day this Sunday, July 24th at your local Swiss Farms store? Swiss Farms drinks are perfect for packing in your cooler for the pool, bringing to a potluck or just to enjoy at your very own oasis at home! Be sure to take advantage and stock up during this one day only deal! And be sure to say thank you to the awesome workers at your location who work extra hard each day to make your day a little easier! Beep! Beep! Thanks for being awesome, Swiss Farms! 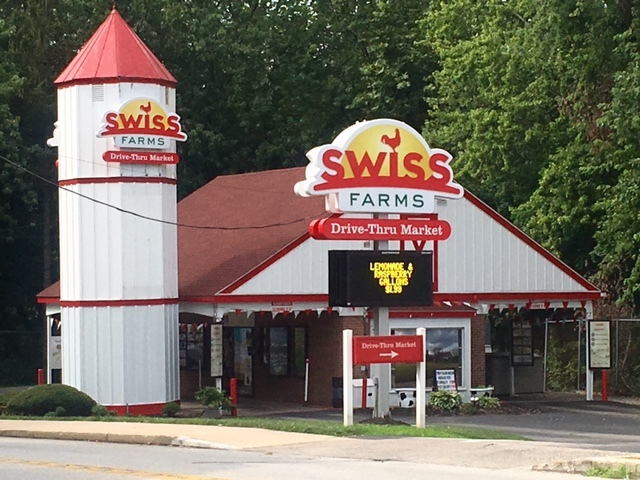 For almost 50 years, Swiss Farms has been a trusted local name for convenience and quality, with 13 drive-thru market locations throughout Delaware and Chester Counties. Offering fresh, lifestyle focused, good for you food choices, Swiss Farms is the only local market of its kind with a registered dietitian on staff to guide healthful product selection. Groceries and fresh meals can be ordered via drive-thru or in advance at SwissFarms.com or via the mobile App. So fun! My son would love this!